27 | November | 2011 | Through the seasons before us..
Groundhog day for Reds in Wales..
Freekick, cross, header, goal. Groundhog Day. It’s that all too familiar story for the Reds really. Weather an early storm, improve and make a decent contribution to the game, a cross comes in – we don’t defend it – goal. A very frustrating habit we seem to be getting ourselves into, and one I’m sure Steve Cotterill must be banging his head against the wall to trying and fix in training. Particularly as we seem to do this after getting a foothold in games. The first half starting slowly, but it was the home side who started brightest (and in truth, remained in the ascendancy for most of it). Five minutes in a cross from Gunnarsson found Gerrard whose shot was deflected to give the Bluebirds the first corner of the game. A rare break from Forest saw Findley and Chambers combining well, with Chambers finally launching a cross which was put behind for a corner. It was scrappy though, and both sides found possession difficult to keep and chances in either direction were at a premium. Then Cardiff seemed to come to life somewhat – a decent ball forward by Gunnarsson looked to give Kenny Miller a great chance but for Lee Camp’s alertness allowing him to get to the ball ahead of the striker. A Cowie cross found Conway at the back post – but he conspired to shoot over from close range under the attention of Gunts. A rare move forward from Forest was created by a long punt upfield from Camp, Tudgay flicked it on to Findley who missed the target from the edge of the box under pressure from the defence. The home side should’ve probably taken the lead as they caught us napping with a quick throw-in ending up with Cowie crossing to Turner who headed straight at Camp. Just before half time an excellent block from Lynch prevented Cowie converting a squared ball from Conway. Half time a welcome break from Forest, and must’ve been frustrating for Cardiff who were starting to look like it was only a matter of time before they’d breach our defence. So a chance for Stevie to regroup the lads and get them firing on, well, some cylinders. It certainly looked that his half time team talk had done the trick too – a much more convincing showing from the Reds. An early chance from a Lewis McGugan free-kick which fell for Tudgay, his shot on the turn looked decent enough but Anthony Gerrard was alert enough to get a block in to deflect the ball out for a corner. Findley was making a pest of himself, too, but he should have done better after burst down the right but making a hash of his cross. But we know this script only too well – somewhat against the run of play for that section of the game Forest concede a freekick – it’s whipped in by Peter Whittingham and defended, well, badly. Joe Mason was the one to get his head on it and put it in at the far post. A decent delivery, a good header – but bloody annoying, it’s like Groundhog day in our goals-against column lately! The answer to the riddle was perhaps predictable (at least two-thirds of it were) from Steve Cotterill – he introduced three subs, Anderson, Reid and McGoldrick were introduced for Gunter, McGugan and Findley. They were immediately involved, with McGoldrick receiving the ball from Anderson and laying it off to Reid whose cross was intercepted by Gerrard at the expense fo a corner. Reid again created danger with a cross in to Anderson who headed across goal, Marshall flapped at it somewhat palming it to Luke Chambers who was only able to head over from close range. Forest carried on pressing, a lovely cross from McGoldrick found Anderson who got to the ball along with McNaughton with the ball looping up over the bar as they all came together. As full time approached Tuds tried to head the ball to Anderson but he couldn’t quite compose himself to get his own header on target. Whilst we pressed we weren’t able to notch that vital equaliser – and (obviously benefiting from hindsight) it does seem we perhaps left it too late to introduce the more potent attacking threats we had on our bench. That said, we were only a defensive lapse away from a draw I suppose. I was expecting a comfortable beating by Cardiff, so that it wasn’t forthcoming should be heartening as we prepare for the arrival of Leeds on Tuesday. 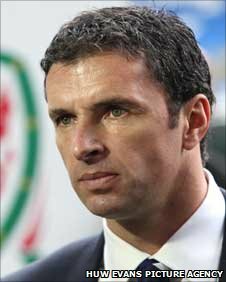 And speaking of Leeds, there’s really only one story in football today and it concerns a former Leeds player – because it was today that Wales manager Gary Speed was found dead in his home, having taken his own life. Such a sad discovery, I was only watching him on Football Focus yesterday and remember him well as a talented player – and judging from the results Wales have been getting lately a talented manager too. Thoughts with his family and friends, and may he rest in piece. 42 is no age at all, such a terrible tragedy. Whilst he had no direct link with Forest I do hope we mark this awful news with a minute’s silence before the game on Tuesday.